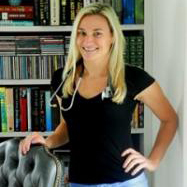 Bridgid is an Advanced Practice Registered Nurse in Critical Care, and currently works in a large teaching hospital in Boston, MA working with Cardiac Arrest patients. She is all about living a healthy lifestyle and promoting wellness to prevent illness through her blog NurseBridgid.com and she just happens to be bit of a fitness fanatic (as well as a Personal Trainer)! All of her blog topics are questions from readers and based on current research (both international and within the US) mixed with a little of her own sass. She lives life to the fullest by not missing a moment, and likes to shake things up daily!